DSE was great but it still feels like a technology show and it needs to do much more to raise its content profile. More than anything else though the show (like so many others) needs to get potential ‘buyers’ through the door – retailers, agencies and brands first and foremost. 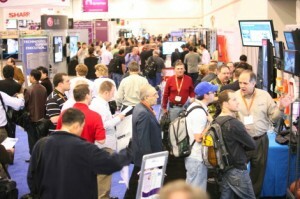 In previous posts, written ostensibly whilst at the show, we suggested bringing the network / media owners’ pavilions to the front of the hall and getting rid of the (isolated) content pavilion altogether and distributing it around the rest of the floor – we would go one step further and start a ‘buddy system’ with content providers and other exhibitors teaming up to share content and make all the stands look slick. Our live Tweets again proved popular so this is something we will be continuing when we can. We have a couple more DSE posts that will be filed by our contributors over the next few days and we will update this meta-post when they come along. This entry was posted on Thursday, March 5th, 2009 at 11:32 @522 and is filed under Scuttlebut. You can follow any responses to this entry through the RSS 2.0 feed. You can leave a response, or trackback from your own site. I’m not surprised that there is still such an emphasis on the hardware/software. As a content house, we are the last to be brought in and as the client stands there with their pockets turned inside out, we find ourselves giving crash courses (for cheap) on why content is so important and why you’re a knucklehead for making it an afterthought. From what I’ve read (tough times wouldn’t allow us to make the trip!) the seminars about content were on point and informative, so that’s good.